Most of you know that I’m deeply involved in fiber. I deal primarily in wool, as a knitter, dyer, spinner, and sometime weaver. Most of you know that I am also on a quest to become omniscient, or all-knowing. In order to achieve that goal, I figure I have to know only know everything, but know how to do everything. Toward that end, last year I bought a couple of raw fleeces – either at the Vermont Sheep and Wool Festival or the Fiber Festival of New England (both of which are just a hoot to attend), figuring that I could learn how to process raw fleece into dyed yarn. 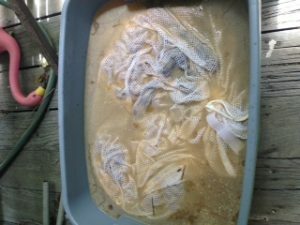 One of the fleeces I bought was washed in the “conventional” way, that is to say, it’s divided into several mesh laundry bags, then gently placed into the washing machine, prefilled with the hottest water the water heater could produce. I used Dawn dishwashing detergent, and let the fleece soak for about a half hour. Then I used the spin cycle to spin out all of the (really nasty) wash water. I washed it three or four times. I neglected to take notes. (I don’t even remember what kind of fleece it was – I think Border Leicester). Then I rinsed it three times the same way – very hot water, soak, then spin. NO AGITATION. That would turn it into a big felted mess. But it didn’t get as clean as I’d like it to be. I am carding that fleece right now, and it’s rather a tough slog. There has to be a better way. Enter the Fermented Suint Method (FSM). Apparently it’s been used for centuries. It’s very cheap. It works very well. Oh, did I mention it’s cheap? But is is disgusting. No, make that DISGUSTING. I had it on good authority that it might smell a bit. Or a lot. Something akin to a barnyard. In the summer. Having grown up on a farm between two farms, and having raised chickens and even a couple of goats, I forged ahead. And the smell is nowhere as near as bad as chickens. When sheep sweat, they produce this substance called suint, which is, by itself, something of a natural soap. This stuff helps the sheep healthy by continuously pushing dirt away from the skin. The dirt migrates out toward the outer tip of the fleece, and the suint keeps it stuck there, where it remains until the sheep is shorn, typically in the spring. Then, following the incredibly easy instructions, I waited. Of course I checked it a couple of times. But when I returned from Maine (oops – with two more fleeces) the next Sunday, I checked, and quite amazingly, the fleece was clean. No dirt in the tips. None! That was in stark contrast with the fleece that I’d washed “conventionally” four times. I then washed the fleece “conventionally” but with considerably less detergent, and rinsed once. I set the fleece out to dry on a sweater drying rack (one that I use specifically for fleece – I am not stupid! ), and it turned out lovely. You can see that in the photo to the left. I immediately followed that fleece with another, a Lincoln fleece from Minnesota (below). After pulling it out four days later, it’s also very clean. Washed once and rinsed twice, it is now drying, and another fleece is in the FSM. While the fleece is still wet, you can see that the dirt has come right out of it. I was questioning that two days ago. Now I’m very happy! 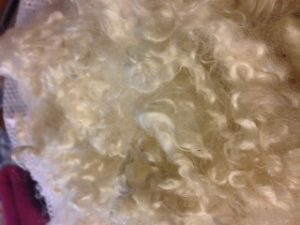 I have several other fleeces to process, but now that I have a method that is not too painful, I don’t mind. 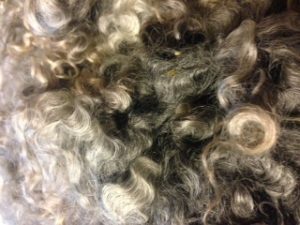 I’m still working on the first fleece – picking and carding, to produce something that I can spin. Subjects for more blogging. Plus I am making a picking machine. This was written by admin. Posted on Friday, June 10, 2016, at 8:18 am. Filed under Spinning and weaving. Bookmark the permalink. Follow comments here with the RSS feed. Post a comment or leave a trackback.